is filled with surprises, just like my cupcakes! While making cupcakes to bring to Tai Chi last Thursday, the phone rang. It was the Pres, who was working with a friend for the day. "Hon...what are we doing tomorrow? Want to do a road trip to Mass and New Hampshire? We have to leave by 5 and I'll bring the truck home tonight." He would bring home the truck loaded with flats of all kinds of annuals and hanging baskets and we would hit the road first thing in the morning. It was very foggy when we left but by the time we were in Massachusetts, it had started to burn off, thanks to the day's sun. Arriving at our first stop by 7 am, the Pres got their order in place while I waited in the truck. We got weighed, together no less...first time ever...imagine that?! and within an hour we were headed to the next next stop over the border into New Hampshire. Filling out the driver's log book to surrender at the end of our journey, the Pres and I reminisced about trips we did years ago...trips made to NJ, Mass, NY, NH...all to deliver the flowers. Ahhh, yes, the flowers growers of America...wonderful people! And now, anxious to get home to plant all the plants, we hit the road. The cupcakes? They were a big hit (especially the peanut butter filled chocolate ones) with the folks at Tai Chi! What a wonderful road trip! And hauling flowers. How cool is that? Oh how fun to do something totally spontaneous and for flowers--You can't beat that, I'd love it too and be glad I had a truck to put them into, there are just too many choices!! When Shane and I were first married, we would pick up and go like this on a whim -- now we have too many farm critters and no baby sitters. Fun trip -- can't wait to see your garden. Sounds like a fun road trip and those cupcakes are precious. Oh, is the Flying J Truckstop still there in the middle of where I-84 has a fairly wide median outside of Sturbridge, Massachusetts? Aside from the location, another rather unusual thing about it is that it looks more like ski chalet than a truckstop. It may not be. For the good people around Sturbridge wanted it gone at least 25 years ago because of it not fitting in with the rustic image they wanted for their community or something like that. 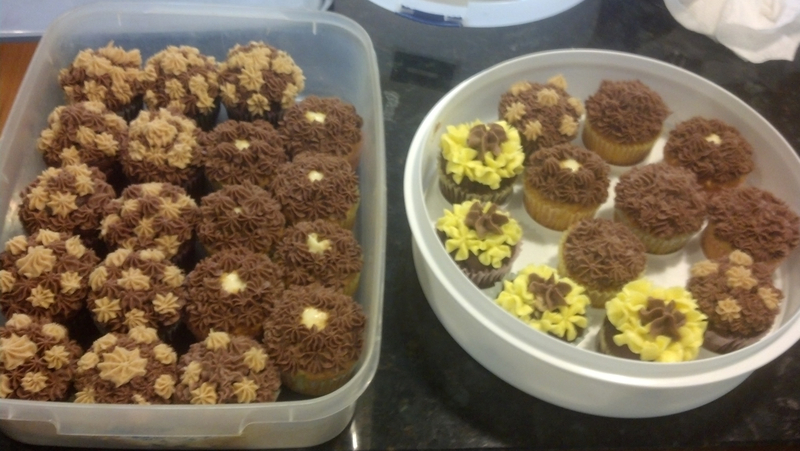 The cupcakes look delicious, wish I had one right about now! of course there was no way to say no to his excitement and what fun any way.